Provide controls for seven temporary skid-mounted package ACUs at the Clipsal 500 V8 SuperCar race, including real-time monitoring of zone temperatures, ambient conditions, damper positions and logging all aspects of ACU operation for comprehensive post-event analysis. All controls and control-wiring to be contained on each ACU platform. Separate heating, cooling and pre-cooling set points. Evaporative pre-cooling of supply air and independent switching set points. 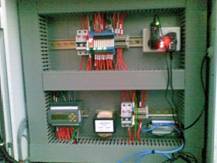 Evaporative water purge and supply solenoid control for each package unit. Supply Air Fan run and fault status with alarms. Compressor fault status with alarms. High-selected zone temperature control of up to 3 separate zones. Minimal wiring due to temporary nature of application (13 sensor cables and 1 actuator cable). Ability to fine tune and adjust during the event, both locally and remotely. Supply-air flow control (VAV) for individual zones on common ACU, for temperature regulation. Monitoring of ambient temperature and humidity. SMS notification to ‘on-call’ staff of individual alarms. Heating: 100% Fresh air - each ACU system uses a single stage of DX (Direct expansion) heating. Cooling: 100% Fresh air - each ACU system uses evaporative cooling through a heat exchanger, followed by 2 stages of DX cooling. The entire system including ducting is required to be dismantled and stored for most of the year. The units are run 24/7 for the four-day event. The temporary nature of the structure requires controls to be mounted on each ACU assembly as it is disassembled and stored at the event end. All controls, supply-air sensors and airflow switches are mounted locally at the ACU on a pre-fabricated skid, and fork lifted in to place every year. This leaves only minimal (and cost effective) temporary wiring every year – a 100m LAN and the zone temp sensors. Fault Monitoring and Annunciation. SMS notification of exact alarm.